The first stage of the digital TV switchover will be marked by a statue made out of old video recorders. 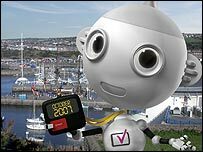 Whitehaven in Cumbria will become the UK's first town to lose its analogue signal on 17 October. On Saturday, a digital television provider offered a free trade-in, with the first 100 customers exchanging their video recorders for new machines. The old machines will be used to create the sculpture, to be unveiled in a secret location in Whitehaven. People are being reminded that after the switchover, all those with a conventional video recorder will not be able to use it to record a different channel to the one they are watching.